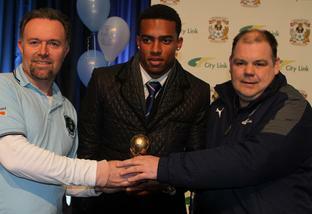 Covsupport News Service were proud to present Coventry City defender Cyrus Christie with the Christy Heffernan Memorial Trophy at the club End Of Season Awards on Saturday. The award, now in it's thirteenth year and won by the likes of Chris Kirkland and Jay Bothroyd who both have gone on to make international appearances, as well as Gary McSheffrey, Craig Pead, Craig Reid, John Eustace, Isaac Osbourne, Leon Best, Aron Gunnarsson, Jordan Clarke and Nathan Cameron, is presented annually by Kev Monks on behalf of Covsupport News Service and a member or representative of the Heffernan family to remember Christy who was a founder member of the Irish Supporters Club and a lifelong City fan before he died in 1997. Sean O'Brien, the Secretary of the Coventry City Supporters Club irish Branch made the presentation along with Kev Monks. Covsupport News Service would like to thank everyone who voted on-line or in person for voting.